The Kitchen Tour, a.k.a. Help Me Plan A Room Makeover. I’ve been watching Ilene redo her kitchen since she moved into her new house and I’ve been overcome with jealousy. I have no talent whatsoever in that department. So what’s a visionless person like myself to do? Take lots of pics, post them in the internet, and beg for help, of course! Looking in from the laundry room, by the back door. 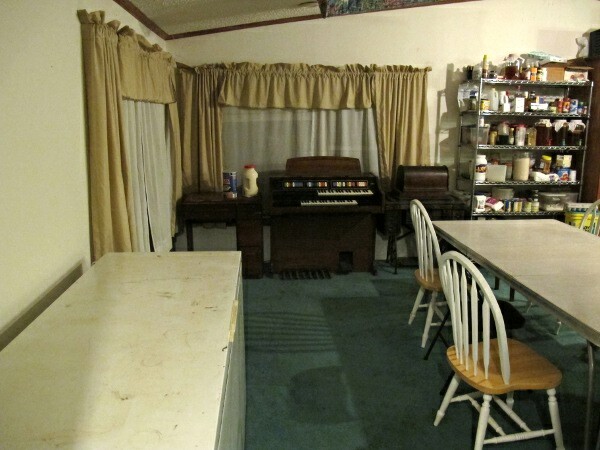 This was my sewing room, among other things, but it’s now serving as a dining room. It stinks that it’s completely carpeted but the little dining area that has vinyl flooring was just too small for all of us. (Two deep freezes are along the wall to the left. 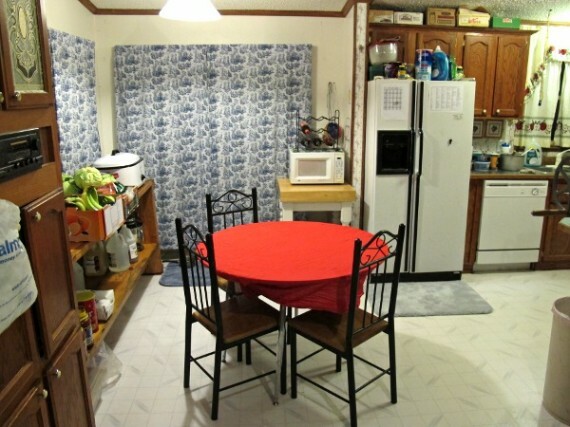 Look 45* to your right to see that little dining area and shelving we use for a pantry & kombucha brewing. That wood monstrosity is a built-in cabinet (and broom closet) in which I house appliances, larger pots, onion, and yogurt making. 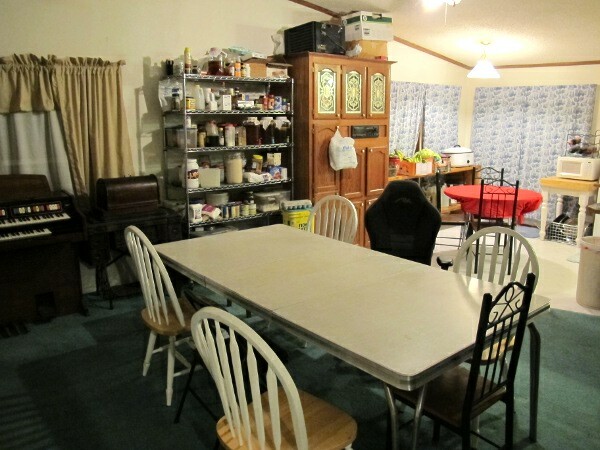 (We’ve since turned the big dining table 90* so we have more walking room while bringing in groceries, etc. Looking further right, you can see additional shelving lining the wall on your right. One unit holds some jars & odd appliances and kefir brewing and the other is crammed with some of my stacks of fabric. Now I’m in the kitchen, looking into the dining room. 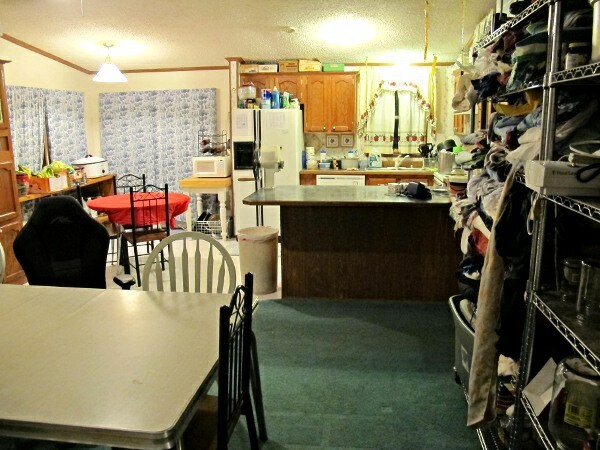 And in the other corner of the kitchen, looking towards the corner we started in (laundry room & back door). Oh, and to the left is the way into the rest of the house (living rooms, bedrooms, etc). Now I’m standing in the back of the kitchen, my back against the stove. In the carpeted dining room, looking towards the kitchen and small dining area. The blank spot along the back wall, where there is an opening in shelves and a rug is on the floor — that’s where we feed the cats & inside dog for now. Now, standing in the small dining area, looking into the kitchen. In the carpeted dining room, by my fabric shelves, looking across the island counter (it’s actually a peninsula but I never heard that term thrown around in such context, have you?) into the kitchen. A shot of the peninsula/island cabinets. A high shot so you can see the wasted space above the cabinets where I am storing some canning jars. Notice the sloping ceiling? Ew. And more wasted above-cabinet space with more jars, plus you can see that little partial wall to the left of the fridge. It annoys me. So there ya go. I know I don’t like the current layout. It’s too cramped. And the carpeting has to be ripped out & replaced in what we’re using as the big dining room now because I really don’t enjoy shampooing the carpets every week. (Not that I do. I just don’t want you to think I’m a lazy slob who lives far too long between shampooings & becomes blind to the stains. Nope. Cuz I wouldn’t do such a thing. Nuh-uh. Not me.) The vinyl flooring in the kitchen is uncleanable in some spots and also needs replaced. We need a new fridge (I hate side-by-sides) and stove (the oven refuses to bake evenly and it’s electric to boot) but both are still working so won’t be replaced for quite a while. I have no idea how to make it more efficient and… dare I say enjoyable? I spend a lot of time in the kitchen so it would be at least not cuss out the cabinets for being too small or the stove for opening right in front of the sink and on and on. We’re open to any ideas and you all know that we’re handy enough to rip out the entire thing and rearrange it completely. It’ll likely be another year before we get around to doing anything to it but I’d like to start planning now. I tend to think & plan things to death so a year’s head start is a good thing. Anyway, good luck ,,,love reading your family adventures! OK, I;ve looked at the pics and so has Hubs. I’d like to see those windows that you have curtains over, how big they are, whether they’re all alike. What direction does the kitchen window face? What’s on the other side of that wall to the left of the freezers? Where is your access to the basement? Would you have someplace else to put the organ? 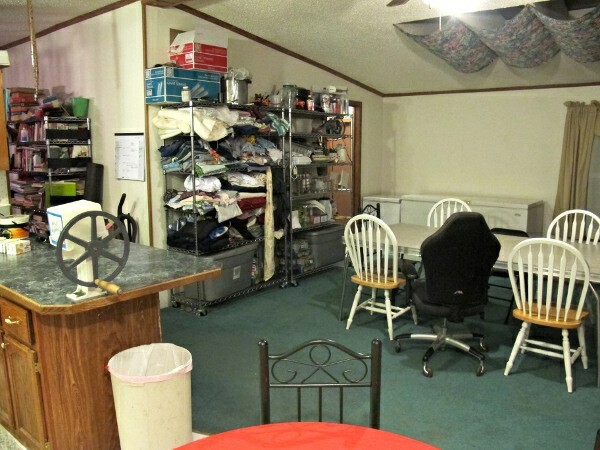 Is this room used for homeschooling as well? Is there any access to that under-counter corner to the right of the sink, or the one to the right of the stove? 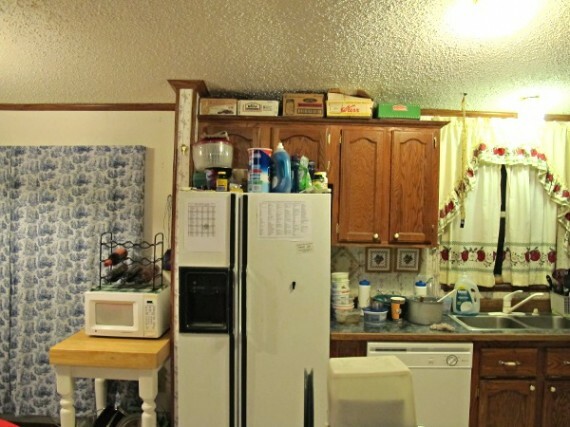 Is the tall cabinet that you use as your broom closet, etc., moveable? Just some preliminary ideas for now. I see that it’s possible you’re losing a lot of your heat up into the peak of that ceiling. You could flatten the ceiling by using a suspended grid that insulated panels fit into. At the sides where the ceiling is at it’s lowest, you could build a “dropped ceiling” effect that extends to the point where you would be able to start your suspended ceiling. You could put can lights in the “dropped ceiling” area, or a recessed fluorescent light above the kitchen sink area. I’d take the curtains off that window over the sink and put shelves across the window, but that’s just me, I don’t like curtains. It would be nice to not have that window that is to the left of the refrigerator and then replace the other window, the one where you do your kombucha brewing, with a sliding glass patio door. Hubs and I agree that the bar is what is making you feel cramped in there. You could disconnect it and make it free-standing and then you could push it anywhere you want. Then you could move your stove further to the right, maybe even into that corner that the bar was connected to. 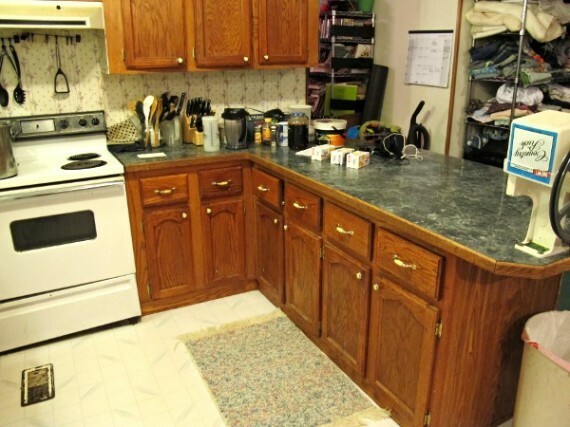 Unless that corner is accessible through one of the base cabinets, you’re losing potential storage space there anyway. New location for the bar could be just a few feet further down, maybe put up a wall or turn that broom closet cabinet 45º, to face the dining area and push the bar against it’s side. You’d have to take the counter off of it and point it in the opposite direction. Or you could take that little wall down to the left of the refrigerator and put the bar along that wall under the windows. 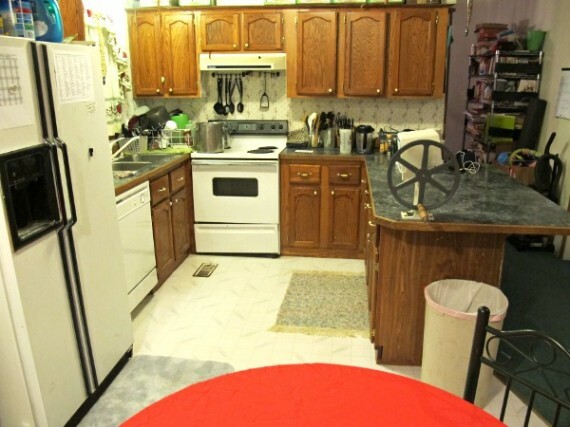 With the stove located further to the right, maybe you could have a lazy susan in that corner to the right of the sink. It’d be tight, like that one of mine is, but maybe you could use it for storage of things you don’t use very often. Better than not having the space used at all. That vent in the floor is right where you have to stand when you work at the sink. Do you have access to that from the basement? 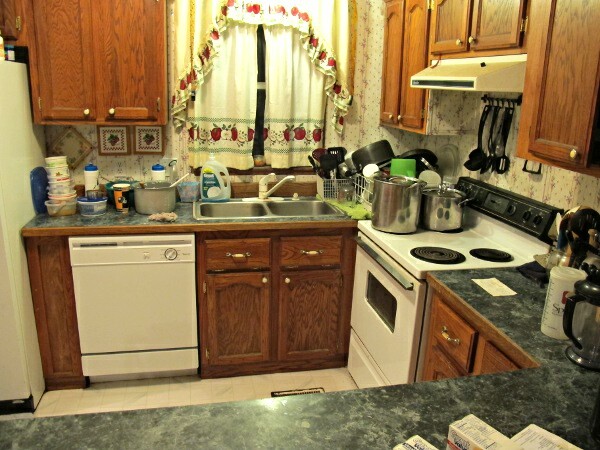 Would you be able to relocate it, turn it 45º and maybe put it in front of those cabinets to the right of the stove, maybe a little closer to the cabinets than it is to the cabinet where it is now? Gosh, you can;t even have a rug there in front of your sink. Cozy in the winter, though, with warm air blowing up your skirt. Heh. 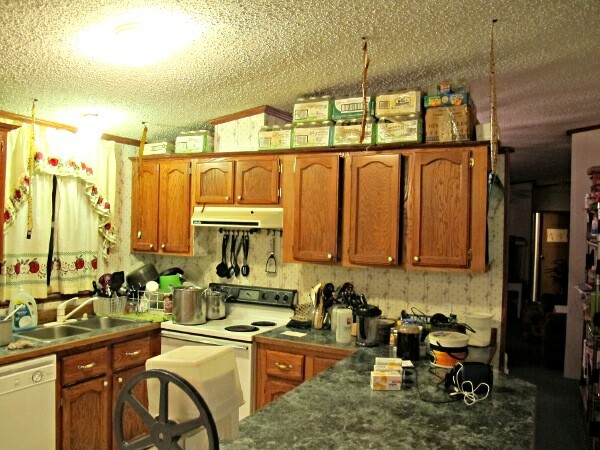 If you want to use above the cabinets for storage, you could build sliding doors up there. But when they get greasy, as everything does in a kitchen after awhile, they want to hang up in the sliders. Years ago, my BIL built my sis a wonderful sewing table. It was a big, waist-high one-shelf bookcase. On the front, he attached hinges and made a wood “apron” the same length as the bookcase, and as wide as the bookcase was tall. When it was in the down position it hid the inside of the bookcase and that’s where she stored all her fabric. When the “apron” was propped up, it gave her a nice wide surface on which to cut out patterns. She had a portable machine, so she stored it under there, too. But later, when she got a machine in a cabinet, he built that into the end of the bookcase. Just a few things to chew on and get your creative juices flowing. You’d be surprised how a few ideas from someone else can make you think of things beyond their suggestions that you never thought of before. I call it brainstorming, it’s an old word from the business world that they changed to “think tank”, and now I don;t know what they call it. A rose by any other name still smells as sweet. Heh. From looking at the pictures, I see a couple of things that probably need to be changed first. The tall built-in cabinet seems to be very misplaced to me. It seems that if you could turn it and move it more out of the kitchen that it would help. I would probably like it more if it were turned with the end toward the wall and maybe shelving put on the back side of it. Like Ilene, I don’t use a lot of curtains except in the bedroom where privacy and light control is important. I planned for curtains in my dining room but couldn’t decide what I wanted so I attached some vines with pretty leaves over the top and down the side 12-14 inches and used mini blinds for privacy. That was 10 years ago, and they are still there. If you move the furniture out and the cabinet more into the next room, will your table then fit in the kitchen area. I love the metal shelving and have some of my own, but since it is out in the open it might be best to cover it. I might put the curtains around the shelving rather than on the windows. In my opinion the thing that will make the most difference to the space will be replacing the floor covering and making it all the same through the entire space. The transition from kitchen to dining area using two kinds of floor covering makes it appear smaller and more chopped up. We had the same problem in our house with carpet under the dining table and in the hall and solid surface vinyl in the kitchen. We took it all out and replaced it with a wood floor. Of course, when this little house was built, that was meant to be the living room, but we have large dining room furniture, so I sort of have a dining room with a couch in it. Everyone comes to the other door anyway which was built to be a den, but we use it as our major living space so we can have a large dining room. 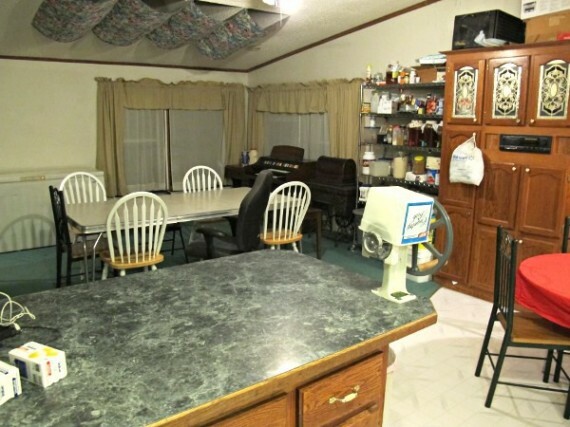 The place in the kitchen which once had a table now has built-ins for the refrigerator and a large pantry. 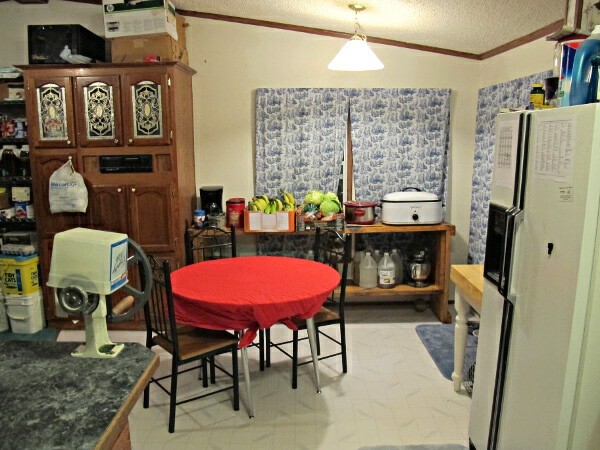 The proper kitchen design is to have stove, sink, and refrigerator in a triangle, but I have found that having the refrigerator on another wall is no problem at all as long as you have a surface to set things on as it take things in and out of the refrigerator. I have the stainless steel table that matches the shelves that you have. Even with lots of counter space, I find the table extremely handy, especially during the gardening season. It serves the purpose of an island, but can be moved. For Thanksgiving we moved it to the end of the kitchen cabinets to hold the Nesco Roasting Oven so the steam didn’t come up under the overhead cabinets. (I saw an oven in your picture). My kitchen is about 98 percent complete and I can send you some pictures if you think it would help you with ideas. Because I have rods in my back and can’t bend over, I try to keep frequently used items as convenient as possible, but I don’t like clutter. Most of my stove-top cookware is in a corner cabinet but it has a two level stainless steel lazy susan that brings everything to the front. I have enameled cast iron that I use a lot and it is kept out in the open on the shelf of the stainless steel table that serves as an island. Almost everything is extremely friendly to use and makes cooking fun. I have a couple of cabinets that I may make some additional changes to, but nothing very serious. I love, love, love my pantry. I think the triangle appliance set-up assumes there will only be one person in the kitchen, so I agree with Carol about the refrigerator being able to be outside of the triangle. In fact, I prefer it that way because it keeps those who come to get things out of the fridge from getting in my way while I’m trying to work. You really do need more counter space and Carols idea about the stainless steel table was a good one. I have some roll-around carts that I push into my work area when I’m canning, doing a lot of baking, or when I’m using my big electric roaster. I also agree with Carol about the flooring. But you want to wait till last to do the flooring. Moving big things around on top of it can cause damage, not to mention that you may relocate something and then there’ll be a hole to patch. For me, the flooring is going to be the most expensive part of the kitchen redo. If you have convenient access to the basement, you could put those freezers down there, and also your canning jars.